GREEN BAY, Wis. - April 3, 2018 - PRLog -- If you have ever attended a formal ceremony such as commencement or presidential installation at an academic institution, chances are you may have seen an individual carrying a rather large metal staff at the head of the procession. Those staffs are referred to as ceremonial maces, and they are growing in popularity as private schools, colleges and universities strive to create a classic feel for a variety of official functions. Medalcraft Mint, an American company that also produces chains of office worn by educational leaders to signify status, works with academic institutions to create attractive ceremonial maces that become regular components of school functions. They are carried before an institution leader by a mace bearer. "Ceremonial maces date back to the Middle Ages and originally were used as weapons," explains Jerry Moran, owner and chief executive officer of Medalcraft Mint. "Today, these beautiful pieces symbolize an institution's commitment to excellence with a nod toward tradition and dignity." Medalcraft Mint's in-house design team brings years of experience to the process of creating custom items for educational customers, including chains of office, inauguration medals, recognition awards and custom medallions. After finalizing the customer-approved design, Medalcraft Mint's craftsmen take over, hand-sculpting or engraving those designs into a die block for use in the die-striking process. Die striking the image components of ceremonial maces produces superior images to cast pieces, while high-quality woods typically make up the unit's staff, stand and base. 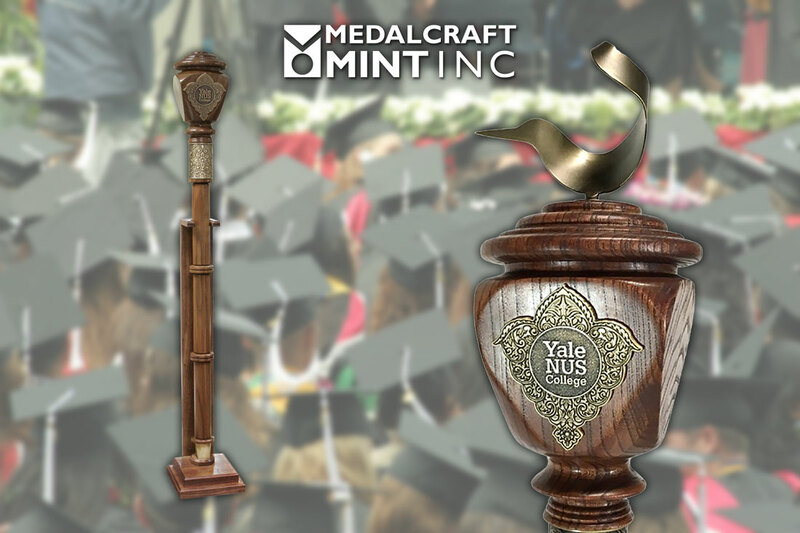 Medalcraft Mint can assist with training in the proper care of wood and metal components to ensure your institution's ceremonial mace remains as beautiful years from now as it does today. "Ceremonial maces are treasured elements of a school's permanent collection," Moran says. "These works of art have the size to provide multiple opportunities for creative use of logos, symbols and even messaging." Medalcraft Mint has been a Wisconsin-based company since its founding in 1948. The company produces a wide selection of challenge coins, badges, recognition awards for employees and other commemoratives in its 32,000-square-foot facility in Green Bay, Wisconsin. For more information about Medalcraft Mint's products or to request a quote, please go to http://medalcraft.com/ or call 800-558-6348. View original article on ceremonial maces here.